In a story which we squeezed in just hours before our February print deadline, Steve Pirie of 3000 hardware support provider Advant reported that the company’s software partner Immediate Recovery Solutions (IRS), has developed a program to transform HP 3000 lockwords to passwords — the character strings needed to operate HP’s ss_update configuration program. The new SSPWD takes an HP lockword — designed to limit use of ss_update to HP’s support personnel — and delivers the corresponding password to let a support provider start and use ss_update. “We’ve seen copies of SS_CONFIG which had a disclaimer, but it just so happens [ss_update] doesn’t, or HP didn’t really care,” Pirie said. The ss_update program can be a key service tool for a support company which needs to configure spare HP 3000 SPU boards. This kind of configuration is only available through HP’s support group today, he added. 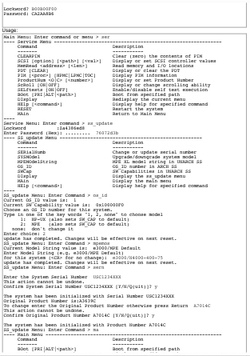 The ss_update software resides on every HP 3000, he added, a theory which might prevent HP from generating another follow-on program for 3000 diagnostics, as it did when an unlocked SS_CONFIG was used by some resellers during 1990s. HP sued and filed criminal complaints against Abtech, Hardware House and others in 1999, claiming that SS_CONFIG was used illegally to switch the personalities of HP RISC hardware, from HP-UX booting to MPE/iX booting systems. HP prevailed in those suits and had California officials plea bargain with resellers in some criminal cases. Pirie confirmed that neither Advant or IRS has discussed SSPWD with HP. The vendor’s exit plans prompted the creation of the IRS program. An example of the jobstream from a SSPWD unlock, then subsequent ss_update operation, is available at the IRS Web page www.irs4hp.com/sspwd.html.